Live in another State, no problem. "A Touch of Texas... Fiddlin' That Is" is an album long overdue in my opinion to the countless fans and supporters of oldtime fiddling. This album has to be a touch of genius "Fiddle-wise" and done to perfection. Terry, however, has long been a musical perfectionist, his career in music beginning at the ripe old age of two years old. I know, I was there. I'm Terry's brother, a very proud brother. Terry's pursuit of his career in fiddling has taken him thousands of miles, across most of the United States, including Hawaii. Although he has been back-up musician for many recording stars, among those appearances on WSM's "Grand Old Opry", Nashville, Tennessee, Terry has become a star in his own right. 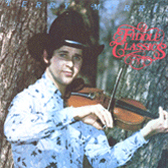 Terry's achievements in fiddling, to name a few, are "Grand Masters Champion" 1976, "World's Champion" 1975, 1976, and "Texas Old Time Fiddle Champion" 1974, 1975, 1976. What I have tried to say however can best be appreciated as you listen to this album. It has been an honor to have had the opportunity to write the liner notes for this album. It has been a pleasure. I am very proud of Terry. Now let's hear some Texas fiddling. 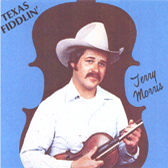 Terry Morris, a true legend in Texas Fiddling will long be remembered in fiddling circles around the world. Not only was Terry a great musician and devoted to the Texas fiddling style, he was also well known for his generosity, warm personality and charisma. This CD is a composite of two different recordings produced in the mid 1980's, but never released. While looking through my "Audio Archives", I found these recordings and decided to compile them together to formulate one entire record. Terry's flawless fiddling and abilty to express himself through his music was heard during these recordings and it really did need to be heard by others! His playing simply reflected just how "at home" he was with his instrument and the "happy state of mind" he was in during this particular time in his life. I feel very fortunate to have found these recordings of Terry and feel that they are perhaps some of the best examples of Texas Fiddling and his art in existence. For the Record... Although it is believed that Terry had few students, he IN FACT had many. He also had many imitators. However, in my opinion, NO ONE sounds like Terry and he has yet to be surpassed. It gives me great pleasure to say a few deserving things about one of my very best friends, and perhaps the greatest old time fiddle player that I have been privileged to hear. 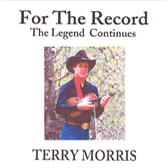 Since he made he his first album, A Touch Of Texas, Terry has won the World’s Championship for the 3rd consecutive year and in this album you will hear the sounds and styling that make him a deserving World Champion. His dedication to old time fiddle music is un-surpassed as he continues to improve the sounds and arrangements of these great tunes. This album is certainly complimented by the three accompanists that produce a rhythm and sound that only a few people have accomplished in this style of music. This album should appeal to the most critical tastes in music with some of the old Bob Wills style, to the very best in Texas Style oldtime fiddling, featuring a fine performance by Terry on his fiddle, and also the lead guitar and mandolin. Terry is one of the most talented and versatile musicians around today -- ever searching for new ideas, never failing to listen to other musicians, their ideas and advice; always with the realization that music is "limitless". The wide range of capabilities acquired by Terry over a number of years is very evident on this album. Having learned from such fine fiddle players as Benny Thomasson, Norman and Vernon Soloman, Major Franklin, Bryant Houston and many others, Terry has added his own style and touch with its spontaneity and improvisation -- never playing a selection the same way twice. Only a couple years ago, Terry decided to branch out further and learn more about the guitar and mandolin. He has done well, as evidenced on this record with his rendition of "Tico Tico" and "Stumbling" on the guitar and "Corinna Corinna" on the mandolin. He is outstanding on the fiddle as always, ranging from a beautiful version of "Faded Love" on the Bob Wills Medley, through the rip-roaring, foot-stomping versions of "Blackberry Blossom" and "Say Old Man Can You Play A Fiddle" -- I might add, the best I ever heard. Terry is most ably assisted by his brother, Kenneth Morris and Royce Franklin on guitar, Tommy Burger on bass, and Elsie Burger on piano, all having much experience in other recording sessions with a number of other musicians as well as with Terry. 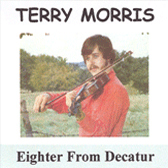 Terry has played with many rather famous musicians, among them Ray Price, and has won many championships in fiddling contests throughout the country, including Texas State Championship several times and the Grand Masters Championship at Nashville, Tennessee. For the past five years, Terry has worked with the Bar-D Wranglers Chuckwagon Group in Durango, Colorado. They sing fine songs of the West, and Terry does a fine job of fiddling on the show. All in all, I'd say if you have any "music in your bones" you will like this album. 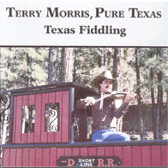 Terry Morris is the undisputed crowned "King of Texas Fiddling". While a great fiddler can come from any part of our nation, the Texas greats such as the famous Benny Thomasson, Major Franklin, Norman and Vernon Soloman, Bryant Houston, Orville Burns and Claude Henson are some of the most copied stylists. These masters all possessed the key ingredients of good music; perfection, complexity and individuality. Hence the term "Texas Style Fiddling" has come to define the expert level achieved only by those taught by these fiddling legends. Terry Morris learned directly from these greats, some of whom are no longer with us. He carries the same musicianship, spark and flavor only the best can provide. Some of Terry's credits will speak for themselves. Seven time and current Texas Champion Old Time Fiddler, undefeated World's Champion Fiddler, winning that title three consecutive times. Terry has also toured the country from coast to coast, playing with or for many top recording artists. Terry has appeared on WSM's Grand Old Opry, he's played as a studio musician on other records and record albums and also toured parts of Canada and Hawaii. So listen to the best fiddler ever recorded in a fine studio, with all the whoopin', hollerin' and drive of a live Texas Jam Session. Terry Morris grew up near Greenwood, Texas, north of Decatur. His father and grandfather played all kinds of musical instruments, and his maternal grandmother played piano by ear. That Terry had talent, too, became evident when he was very young. His experience with breakdowns and contest fiddling began when he was about seven. 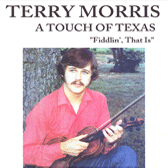 In 1972, Terry began learning to play the fiddle and two years later he fiddled his way to the title of 1974 Texas State Champion in Burnette, Texas. While on his honeymoon in 1976 he won the title of "World Champion Fiddler" for the second year, and also the title of "Grand Masters Fiddler" the same year in Nashville, Tennessee. 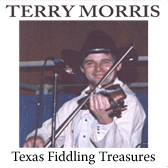 Terry has won many titles in the nine years he has been fiddlin': among them "Texas Old Time Fiddlers Association Champion", 1974, 1975, 1976, 1977, 1978; "World Champion Fiddler" 1975, 1976, 1977 (retired undefeated); "Grand Master Fiddler" 1976. Terry has also performed professionally, touring many states, including Hawaii and has played on the Grand Old Opry several times. He has spent the past three summers playing with the Bar D Wranglers at the Bar D Chuckwagon in Durango, Colorado. Jamming at Bobby’s has been the favorite CD, of many who have purchased CDs of Terry. The reason, they’ve told us, is the “live sound”, the “spontaneity of a rip-roaring Texas fiddle jam session”. Recorded during the later period of Terry’s life, approximately 1986, it was the result of “practice” for an upcoming recording session in Levelland, Texas. This session in Levelland would result in two recordings, Texas Fiddling and Pure Texas. Some of the selections on Jamming At Bobby’s, therefore, are the same as to be found on other recordings of Terry. As most are aware, as far as Terry’s playing, he seldom played a song more than once, without it being entirely different. 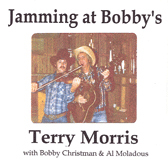 Tunes on Jamming At Bobby’s are different versions from other recordings of Terry. You will enjoy the relaxed jam session feel of this recording. As I was completing this project of making all of Terry’s recordings available on CD format, I realized I had several songs, remnants, so to speak, that I should and must also make available. After all, there will never be any more recordings of Terry. I compiled these on a CD and named it for what we really felt it was, Treasures. As a collector of recordings by Terry, you will also “treasure” this recording.